A new library webpage lets students navigate research resources more easily. 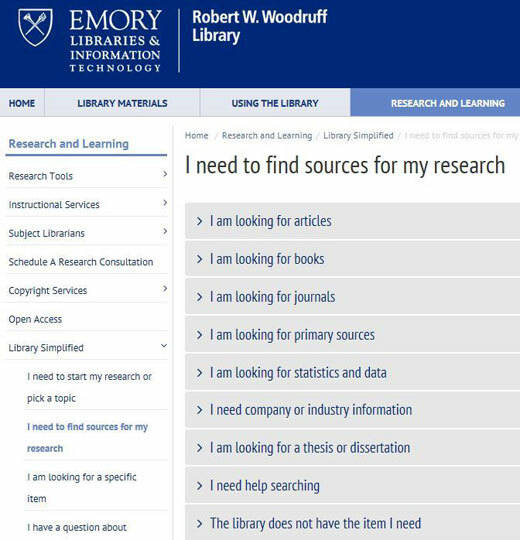 Emory's Robert W. Woodruff Library has created a do-it-yourself webpage to help students new to college-level research find answers to their specific questions and conduct successful research. The webpage, called "Library Simplified," is modeled after that of Portland State University’s library. Portland State’s library technologies department developed an open-source platform for its DIY webpage, which Woodruff Library’s Outreach and Education group adapted for its own platform, says Erin Mooney, library outreach and education coordinator. "The library has hundreds of research guides created by librarians that help students with particular subjects and classes, but Library Simplified is a kind of FAQ about the research process and a way to find an answer to a particular question quickly and easily," Mooney says. It also addresses myriad other issues faced by beginning researchers – and sometimes by experienced ones. The page contains videos and graphics to provide more information on the answers. Mooney says she became interested in creating a research guide for international students based on their questions that came up at library sessions for past ACE Programs (Academics and Culture at Emory), which are held prior to the start of the academic year to help students from other countries adjust to academic, social and cultural life at Emory and in Atlanta. When Mooney learned of Portland State’s DIY page and open-source platform, she says she quickly realized such a research tool would be highly useful not just for international students, but also for any first-year students and beginning researchers. Much of the information was already on the Woodruff Library website under LibAnswers, but it was not easy to find. Chris Pollette, outreach and emerging technologies librarian, adapted Portland State library’s open-source DIY architecture to work on the existing library website. "Library Simplified" is not meant to replace getting help from a subject librarian, as a student’s interaction with a knowledgeable library research expert can be valuable. However, the DIY webpage can provide quick answers to specific questions from anywhere at any time of day, Mooney says. "This is available 24-7," she says. "If students just need information on a specific aspect of research, they can get a targeted answer." Natalie Cruz, coordinator of International Student Life at Emory, says not only are international students grappling with language and cultural differences, but library and research terms differ among countries also. Cruz says students using the Library Simplified guide will relate to topic areas such as "I’m not sure where to search"; "The library doesn’t have what I need"; "I do not know which sources are appropriate to use"; and "I need help avoiding plagiarism" — all designed to help students navigate the guide more easily. "I think it will be a great resource," she says. "With the questions, videos and other graphics, it’s going to make it a lot more accessible for them and give them more confidence to be on the same playing field with American students who already have the cultural knowledge that is sometimes taken for granted." For more information, contact Erin Mooney at erin.mooney@emory.edu.